Looks nice! But isn't drawing on a computer/laptop hard? Like it doesn't feel as "smoothly" as it is when you draw on paper with a pencil. It's alright, I'd rather use a computer than a tablet because I guess I'm just used to it. 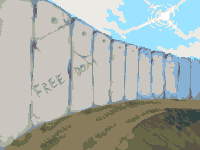 With pencil and non pixelart I find it easier to do things because you're not placing pixels one at a time. 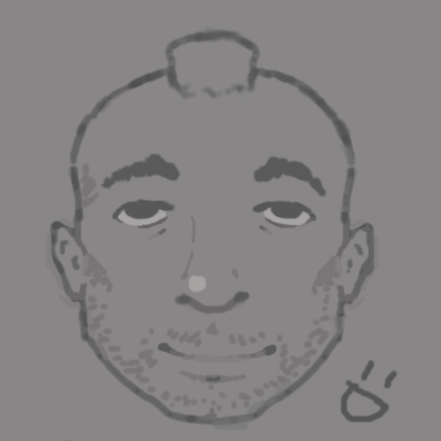 I can't draw for anything. Nice work though! This is what I've been working on a bit today. In the end I want to have the skeleton riding a horse. I'll probably end up changing the palette a ton and maybe expand the canvas.. Hopefully it will look very realistic in the end. Woah, I love it! Looking forward to seeing the finished product. Thanks Hopefully I don't end up scraping it. Here an small update on a somewhat old piece. 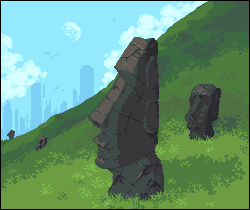 Updated the clouds and textures of the rock. Title was untouched lands hah. Here's a sloppy piece I'm working on. 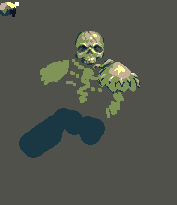 The palette is really bad right now so I'll hopefully have an improvement on it soon. Anyone have an idea of where this is :p?